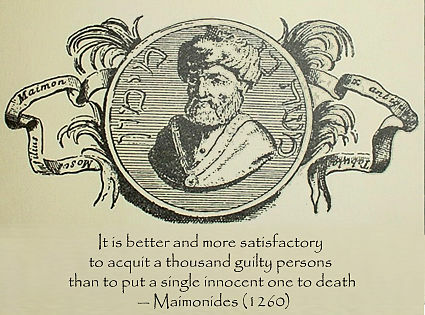 See the gallery for quotes by Maimonides. You can to use those 7 images of quotes as a desktop wallpapers. Teach thy tongue to say 'I do not know,' and thou shalt progress. Anticipate charity by preventing poverty. 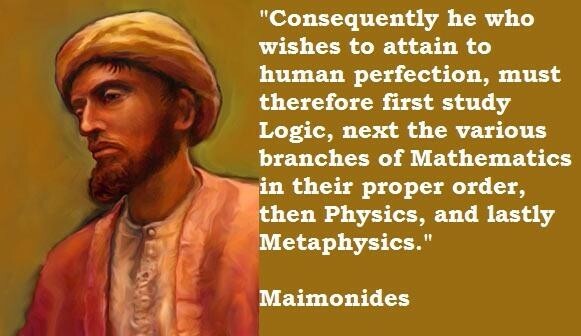 Consequently he who wishes to attain to human perfection, must therefore first study Logic, next the various branches of Mathematics in their proper order, then Physics, and lastly Metaphysics. While one man can discover a certain thing by himself, another is never able to understand it, even if taught by means of all possible expressions and metaphors, and during a long period; his mind can in no way grasp it, his capacity is insufficient for it. 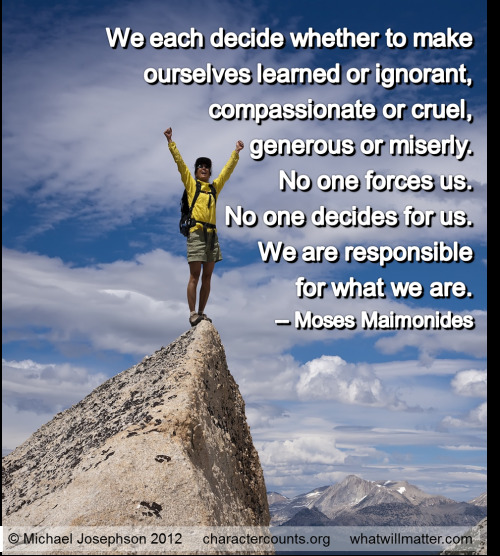 Now, we occupy a lowly position, both in space and rank in comparison with the heavenly sphere, and the Almighty is Most High not in space, but with respect to absolute existence, greatness and power. Do not imagine that what we have said of the insufficiency of our understanding and of its limited extent is an assertion founded only on the Bible: for philosophers likewise assert the same, and perfectly understand it,- without having regard to any religion or opinion. Further, there are things of which the mind understands one part, but remains ignorant of the other; and when man is able to comprehend certain things, it does not follow that he must be able to comprehend everything. If a person studies too much and exhausts his reflective powers, he will be confused, and will not be able to apprehend even that which had been within the power of his apprehension. For the powers of the body are all alike in this respect. 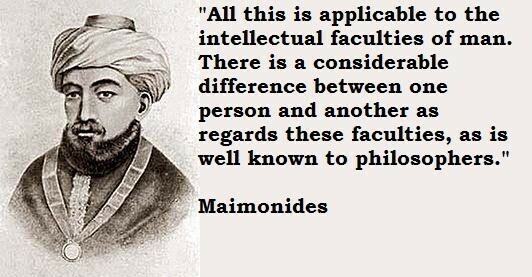 The same is the case with those opinions of man to which he has been accustomed from his youth; he likes them, defends them, and shuns the opposite views. You must consider, when reading this treatise, that mental perception, because connected with matter, is subject to conditions similar to those to which physical perception is subject. 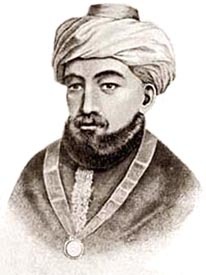 The whole object of the Prophets and the Sages was to declare that a limit is set to human reason where it must halt. 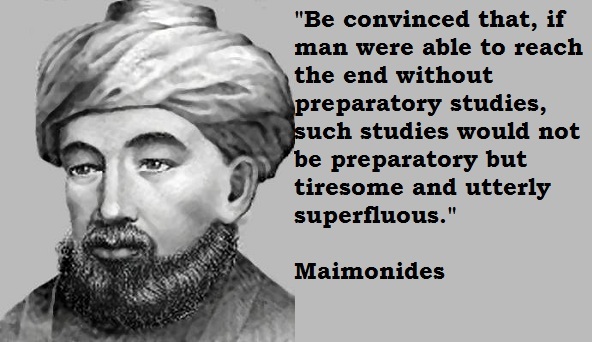 Be convinced that, if man were able to reach the end without preparatory studies, such studies would not be preparatory but tiresome and utterly superfluous. How individuals of the same species surpass each other in these sensations and in other bodily faculties is universally known, but there is a limit to them, and their power cannot extend to every distance or to every degree. 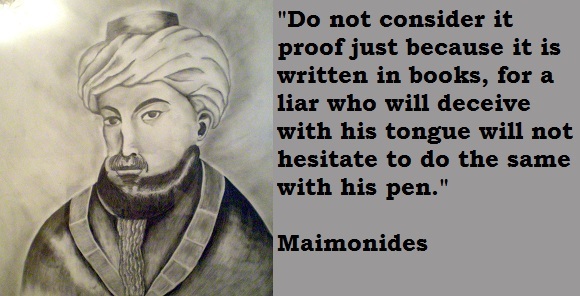 Much more quotes by Maimonides below the page. It is thus necessary to examine all things according to their essence, to infer from every species such true and well established propositions as may assist us in the solution of metaphysical problems. I have never known a really chic woman whose appearance was not, in large part, an outward reflection of her inner self. To be well turned out, a woman should turn her thoughts in.